Founded in 1885, Woods is among the oldest and most respected outdoor brands in the world. Durable quality you’ve come to expect from Woods. Our water repellant and rot resistant tents are available in a variety of sizes with a flame retardant fabric option. Fireproof stove pipe rings and tough hard-wearing pole sets. 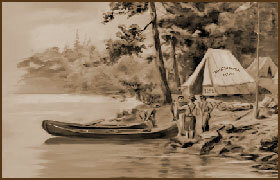 Founded in 1885, Woods Canada is among the oldest and most respected outdoor brands in the world. Woods is proud to have been involved in a number of events which have shaped our country. In particular, the products that Woods has developed and produced for use in Canada’s Arctic, have allowed Canadians to explore this region and to live and work in some of the harshest weather conditions in the world. Since 1885 , Woods products have been chosen by and endorsed by many of the great adventurers,explorers, outdoorsmen and pioneers of the past century, including Admiral Richard Byrd, Robert Peary, Harry Snyder, Kermit Roosevelt, Walter Woods, Sir Hubert Wilkins, Father Hubbard, Ernest Hemingway and Bradford Washburn. For over 123 years, explorers, pioneers, adventurers and outdoorsmen have relied on Woods. James W. Woods began his business in 1885, selling canvas and canvas products to lumbermen, prospectors, adventurers and explorers. By 1895, he had established his own manufacturing facility and began to produce tents, sleeping bags and clothing. "The second I opened up the box of the Woods CA Prospector tent, I knew I had a quality shelter on my hands. The first thing I noticed were the taped seams pushing out of every edge of the tent. Each seam was double stitched over to prevent any catastrophic stretching from the extended use of the tent. At every corner, there was a double layer of canvas to reinforce the stretch point. This was especially true for the inside corners where the ridge pole set in. Each piece of cotton tape that was loose, used for holding the doors open, were also rigidly made and double stitched to stay on during any problematic pulling that can occur when moving the tent, rolled up..."